The Theun-Hinboun hydropower extension project has been officially inaugurated in Khammouane province, further boosting Laos's electricity output. 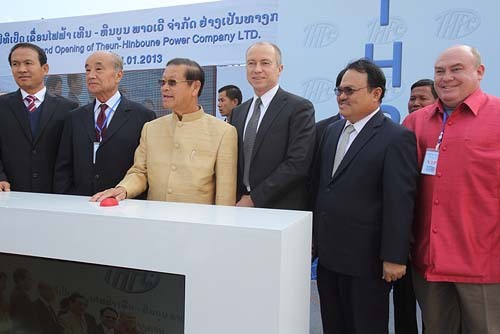 Deputy Prime Minister Somsavath Lengsavath switched on a new 220-MW turbine at the Theun-Hinboun powerhouse in Khounkham district at a gathering of Lao leaders, project partners, international guests, and staff of the Theun-Hinboun Power Company (THPC). The expansion project also features a 60-MW turbine at the new dam and reservoir on the Nam Gnouang in nearby Bolikhamxay province, bringing the combined capacity of the original and new THPC powerhouses to 500 MW. At the opening ceremony Mr Khammany Inthirath, Vice-Minister of Energy and Mines, called the project an example of the country's outstanding success in electricity development. He said the Lao electricity industry has become an important foundation for national socio-economic development, "allowing us to increase production of goods and transform production methods, so actively helping to improve living conditions and reduce poverty for our entire people". THPC, which has invested US$720 million in the expansion project, is 60% owned by EDL-Generation, with Thailand's GMS Power and Statkraft of Norway each holding 20% of the company. Mr Khammany noted that the company has invested heavily in environmental and social works, contributing to the development of education, public health and community infrastructure in the area around the project. Mr Christian Rynning-Tönnesen, the CEO of Statkraft, said the project provided Laos with another low-cost, efficient and clean source of power. According to Mr Rynning-Tönnesen the original Theun-Hinboun plant is one of the most reliable hydropower projects in the world, with an availability of almost 99% in normal operation. "In a world facing damaging global warming due to emissions of greenhouse gases, more renewable energy sources in general, and hydropower in particular, are of growing importance in order to fight serious climate change," he said. Former Thai foreign minister Dr Subin Pinkayan of GMS Power called the expansion a "state-of-the-art project that increases the power potential of the Nam Theun basin". He said that THPC has put itself at the forefront of responsible hydropower planning and practice and described the project as a mutually beneficial alliance between Laos and Thailand, between the public and private sectors, between Eastern and Western nations, and between technical engineers and social and environmental scientists.